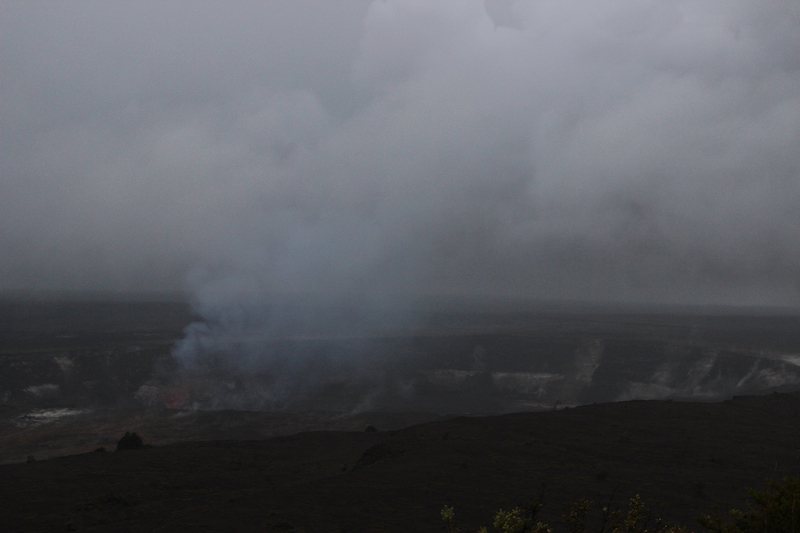 It seems the Volcano area is constantly raining. Rain, rain, rain. So it made me wonder whether or not the constant chain smoking of the volcanoes cause an effect on the weather around the area. According to my nifty Google search, it changes the atmosphere and climate because all the ash that gets thrown up into the air attracts and collects water droplets. The air also has a pretty distinct smell, I believe it’s due to the sulfur dioxide but to be honest it was pretty tolerable. 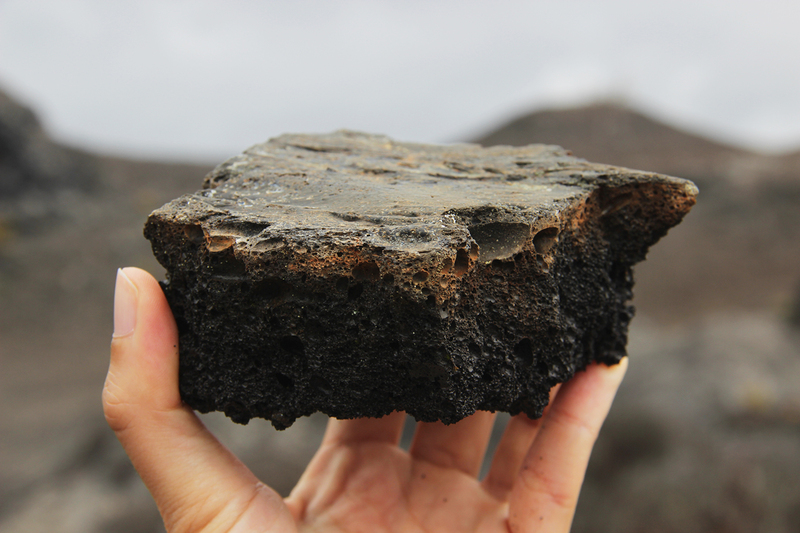 The sulfur dioxide around Mt Fuji in Japan is a lot more of a stench (like rotten eggs). Just imagine the ammunition of CO2 that the volcano itself has on its own to shoot away at the ozone layer too. It might be rude or ignorant of me to question but…. are the locals mainly lured here to live because of the tourism opportunities? Is the land cheap? What does Volcano Village offer to counteract the wet weather and polluted air? 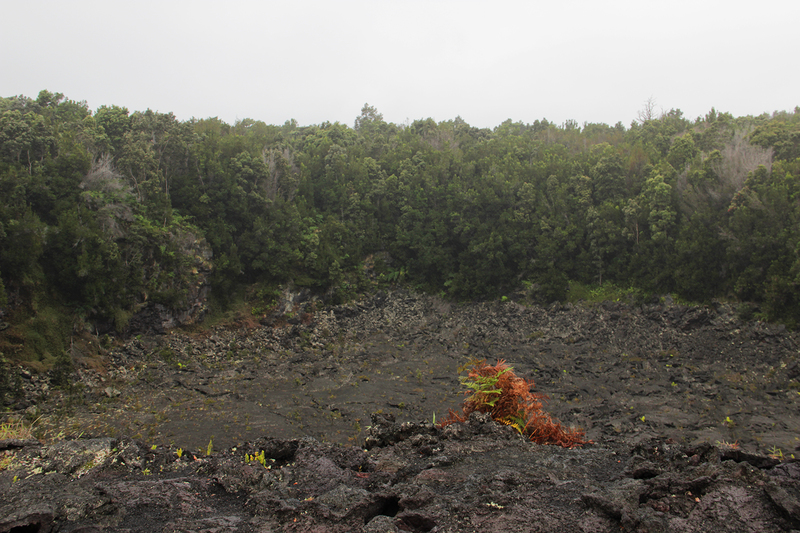 The volcanoes in Hawaii are some of the most observed volcanoes in the world. Mainly due to how active they are. 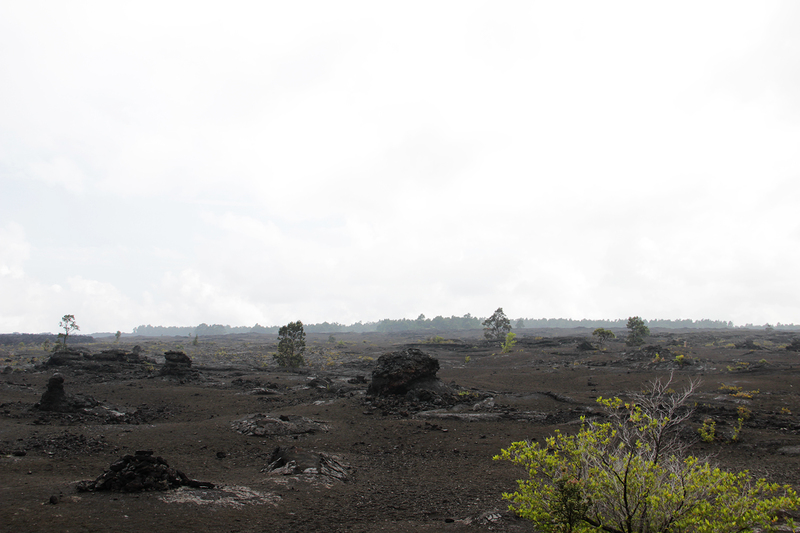 Mauna Loa last erupted in 1984 and before then averaged an eruption once every 5 years. 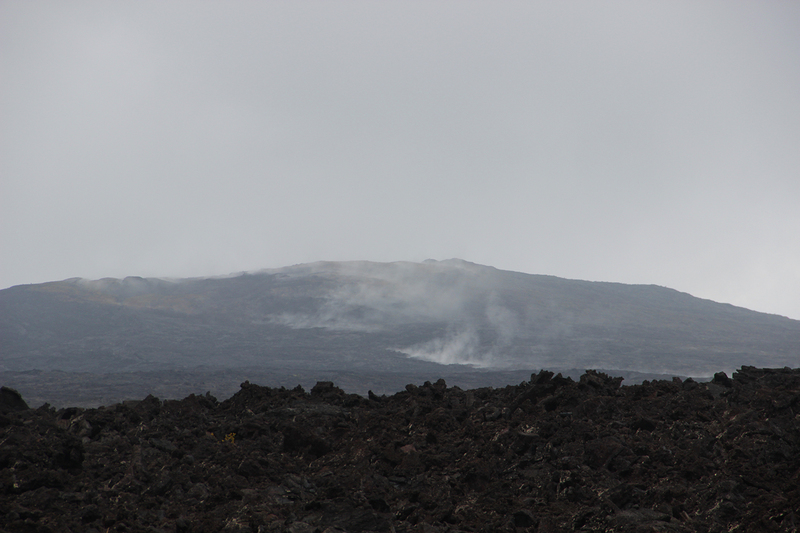 It also doesn’t seem like the volcano is on its deathbed so volcanologists do think that an eruption might occur soon. Towns nearby like Kapoho had previously been wiped out by eruptions… which just really adds to my curiosity to the questions above. 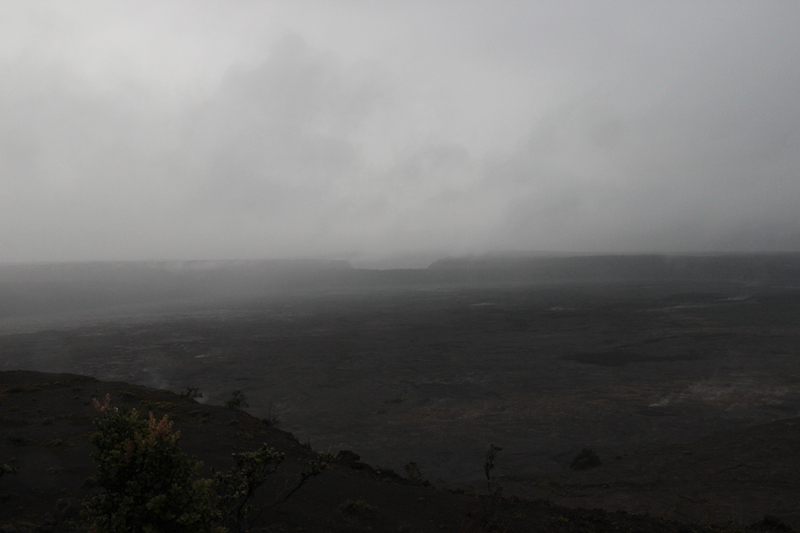 Anyway, it was the time in our trip to explore the Hawaii Volcanoes National Park. 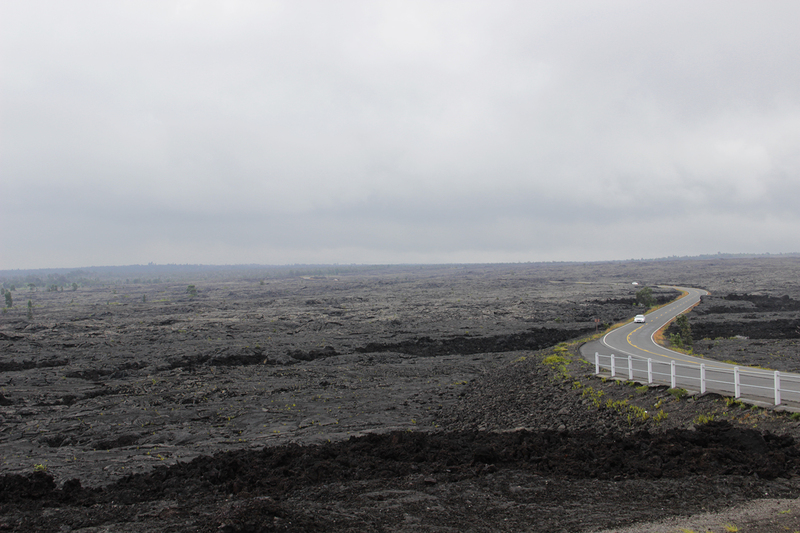 We decided to do the main run down Chain of Craters road which was a trip of 1 hour each way just in distance. 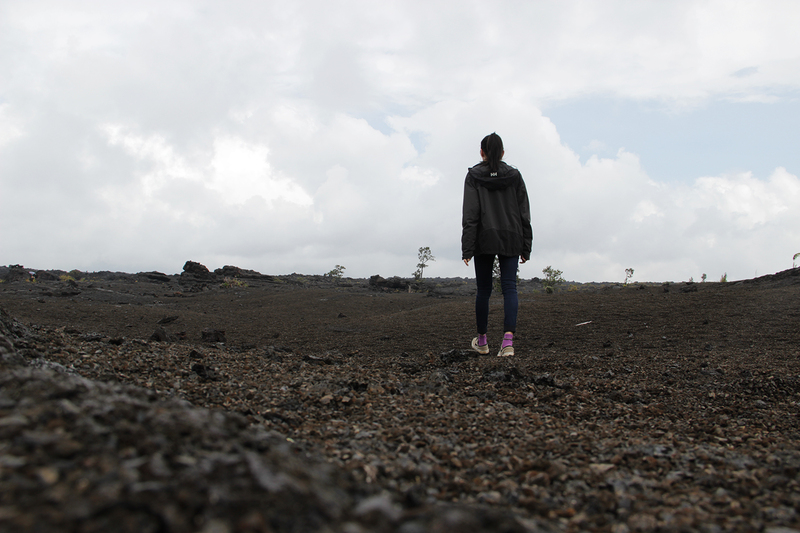 As we hadn’t yet really explored old lava fields but have driven past many of them on our Big Island road trip, we stopped at the first site of Lua Manu to get up close and personal. The rain made some of those colours really shine. 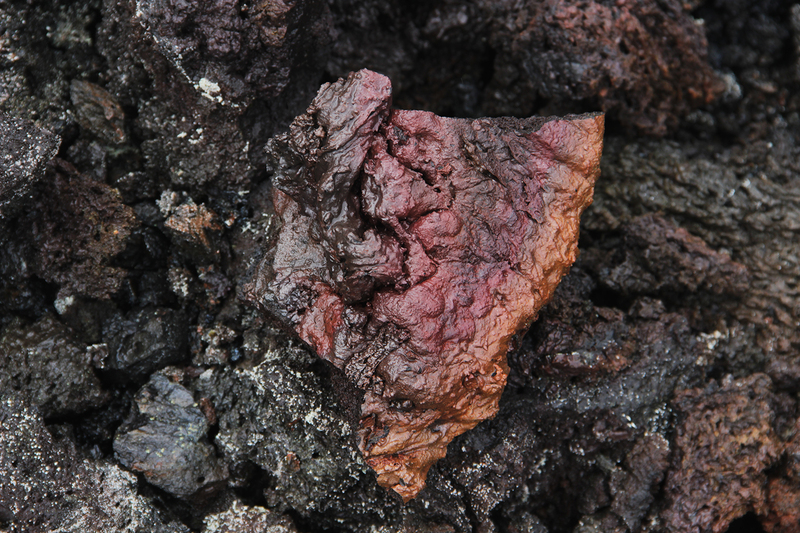 I’m not sure what causes some of the blues in the lava but I do know the reds and oranges are due to oxidation when it was in the process of cooling down. The formations were crazy. It’s really bizarre to think that this is how the world has been built. Through this ugly, destructive and yet seemingly unfruitful process. But after decades, vegetation slowly does come through. Though I’d really like to know what the breakdown process is to finally end up with some nutritional soil and earth because I know the volcanic turmoil isn’t too capable of growing much. 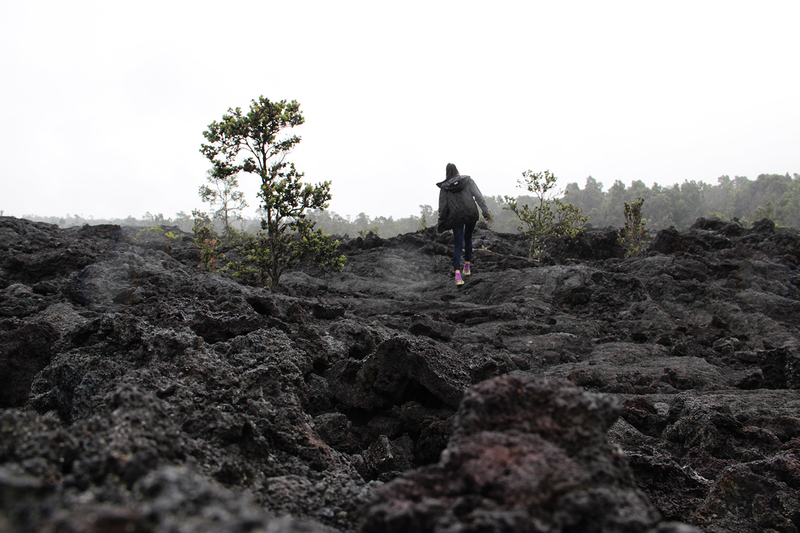 We went on top of lava mountains and underneath into old lava tubes and caves. 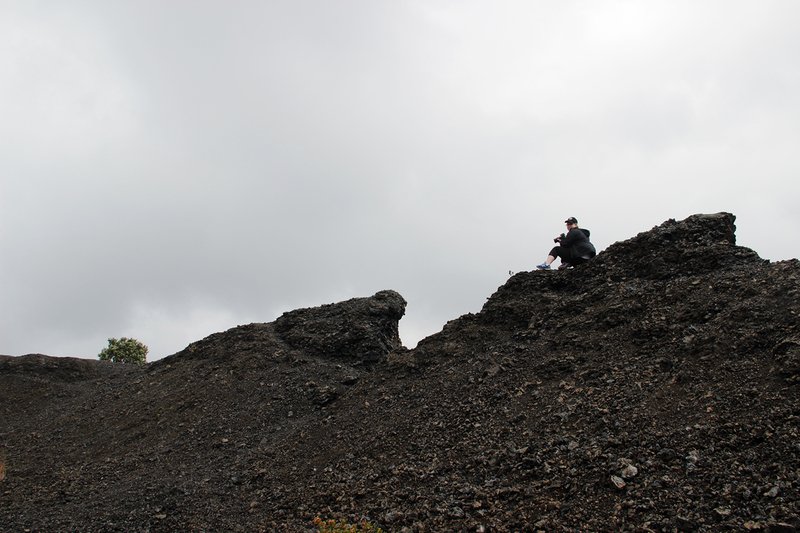 We even had our toes peering over the edge of old craters. The land just looked like an apocalypse had washed through. These are Nene! 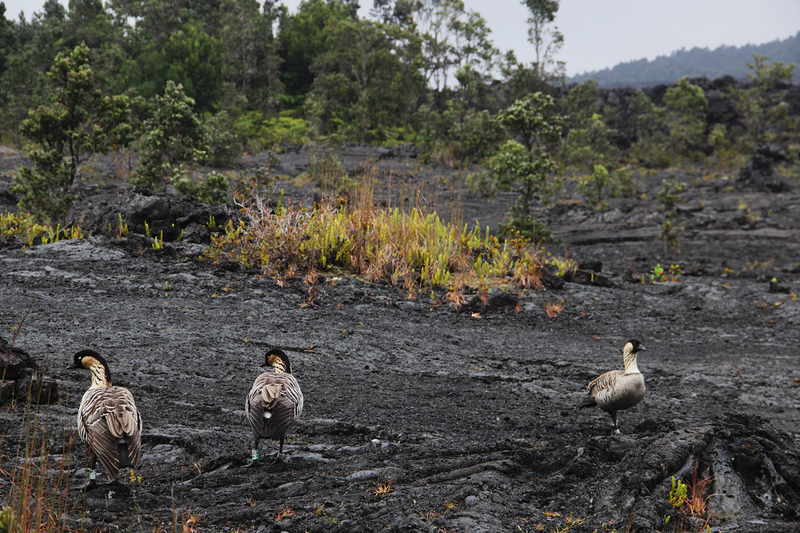 Known as the Hawaiian goose and are endemic to these islands. 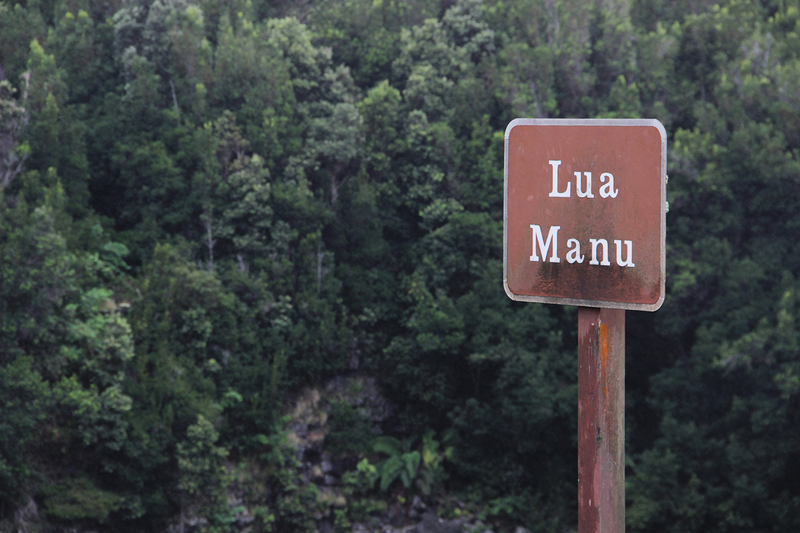 Our next stop was the Mauna Ulu trail. 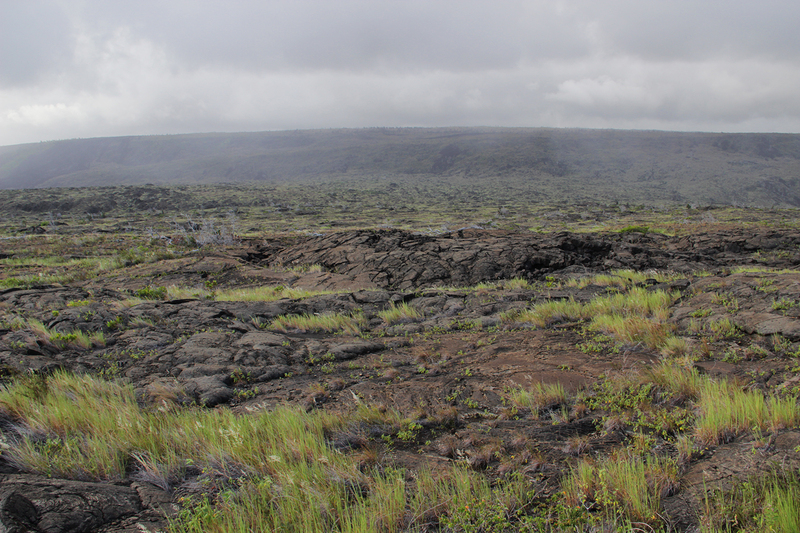 This site is one of the longest rift zone eruptions of Kilaulea (one of the active volcanoes). 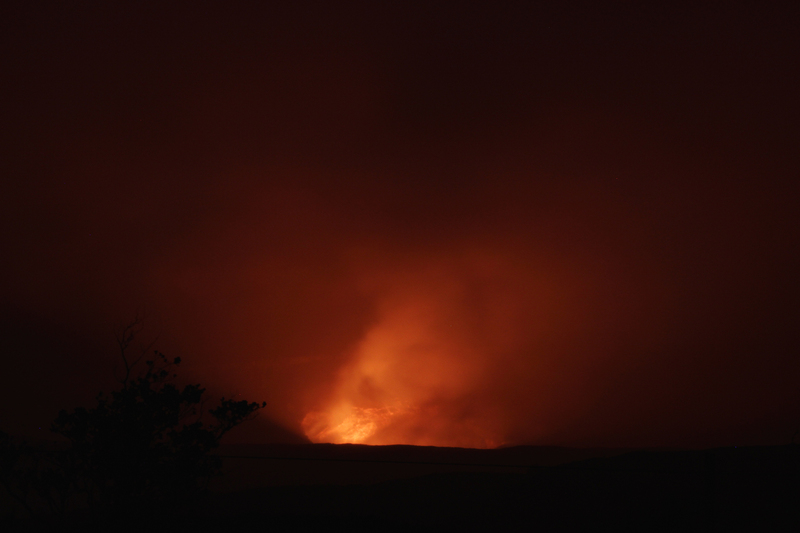 From 1969, earthquakes created a large fissure in the earth which then allowed a five year eruption to weave the creation of the new mountain, Mauna Ulu. 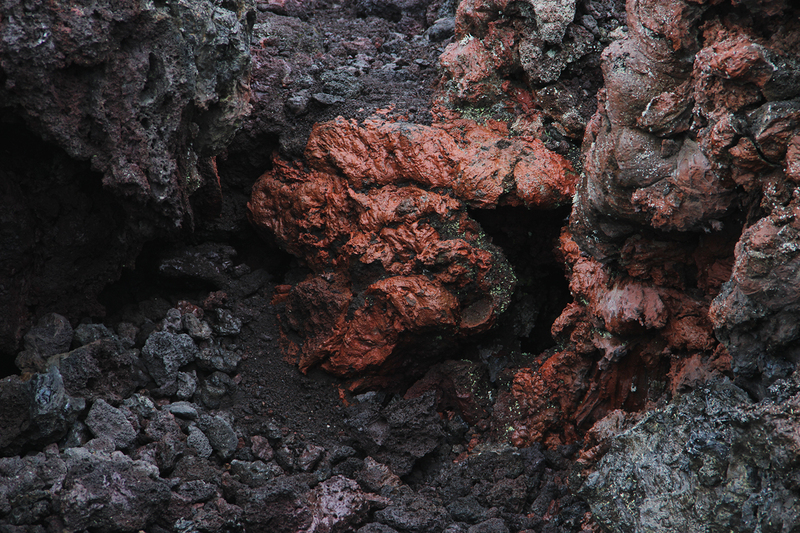 Looking at all the different lava fields and their terrain, colour and textures – I thought they either looked like gigantic termite nests or an enormous homemade brownie. 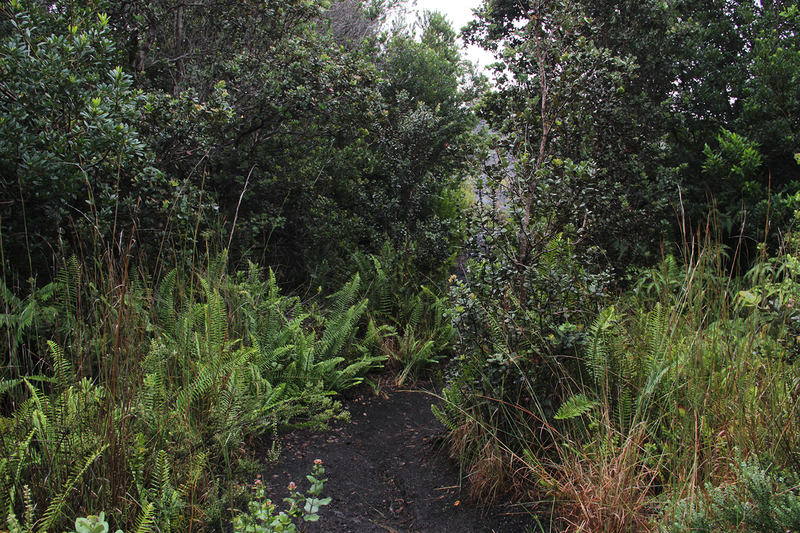 We then continued on along Chain of Craters road to get to Kealakomo. 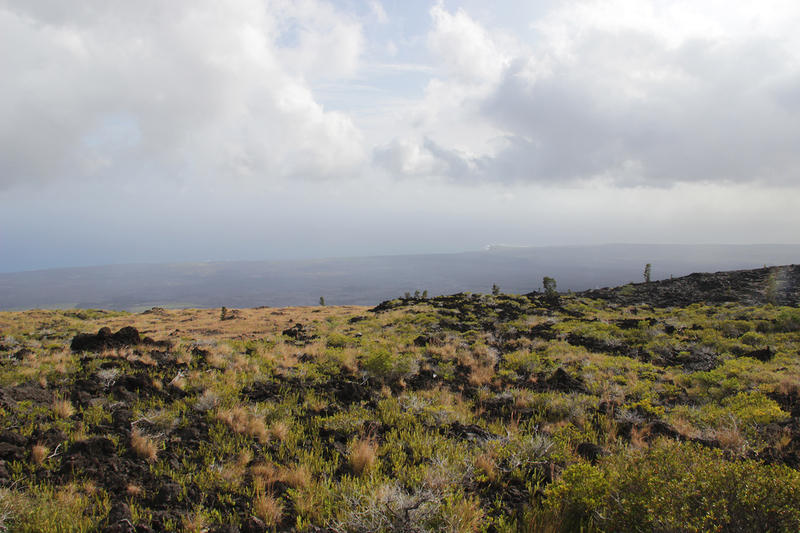 A high altitude point in the trip that overlooked the barren coast of the Big Island. We then headed for the coastline, so we weaved our way through desolate cliffs to.. more desolate areas. This time though, we got to see some signs of civilisation. 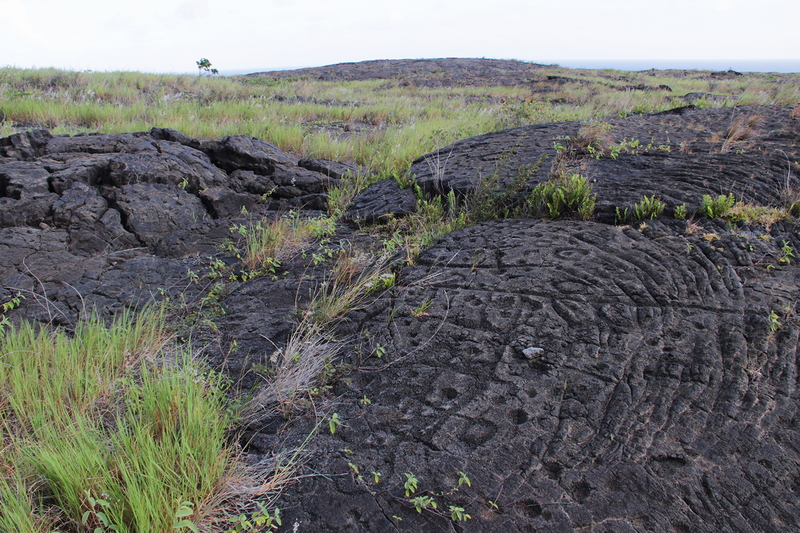 We ended up at the Pu’u Loa Petroglyphs – the biggest petroglyph field in Hawaii. It was about a 1.5 hour hike in total but was definitely a cool thing to see. There’s over 23,000 petroglyphs on the site. If you have a look, the most common petroglyph was just an inscribing of a hole. 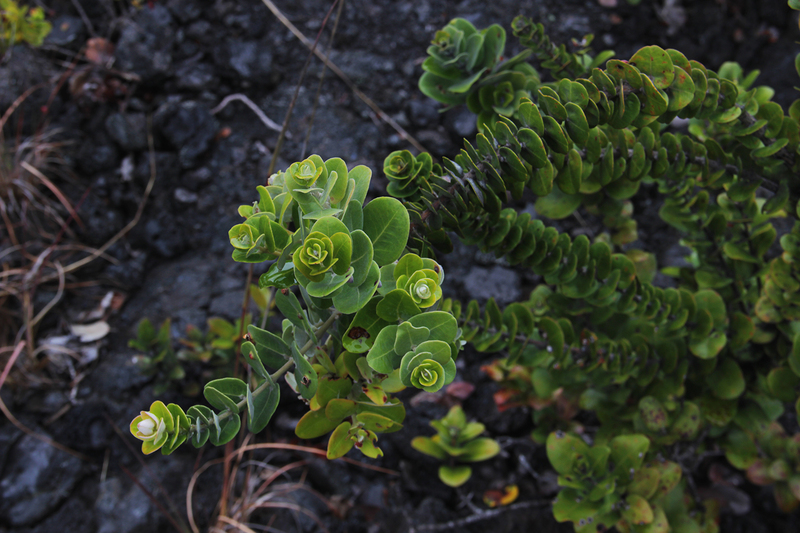 A tradition of the Hawaiian natives is to place the umbilical cord (pika) of a child into an engraved hole as a gift to the gods to then be reciprocated with a blessing for the child’s life. 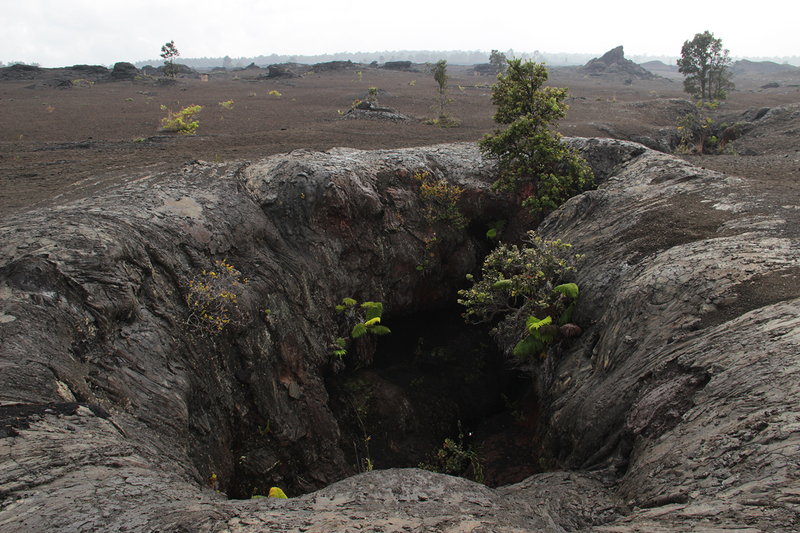 Each hole is called a puka and is never doubled up. 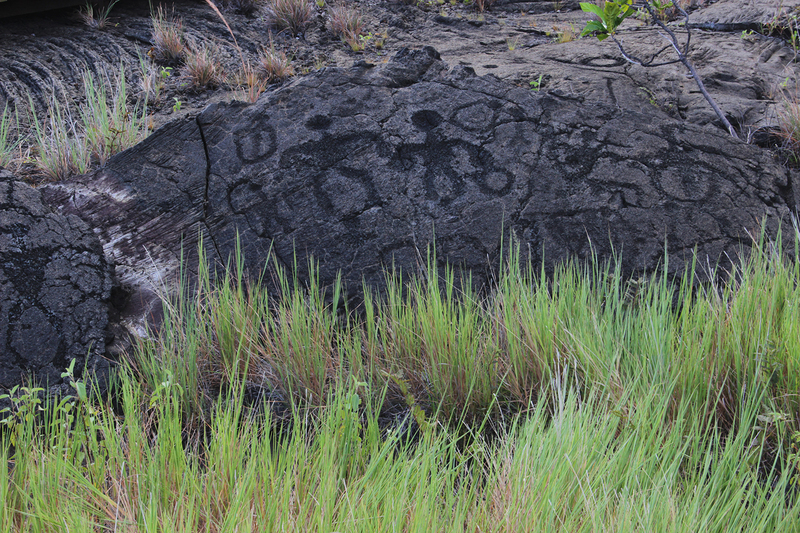 In this site, 16,000 of the petroglyphs are pika-related carvings. 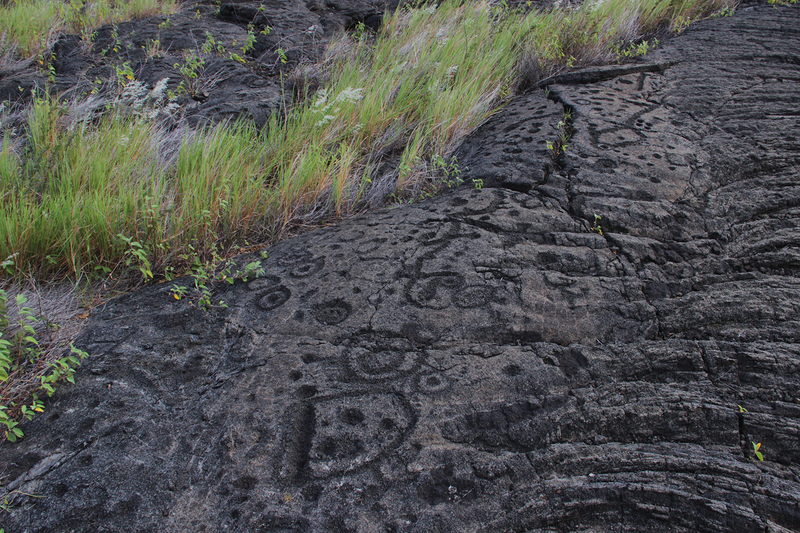 The Hawaiian natives lacked a form of written language but some of these petroglyphs stood out in meaning. I hiked back to the car, demolished a whole bottle of water and then continued the drive down to the coastline. 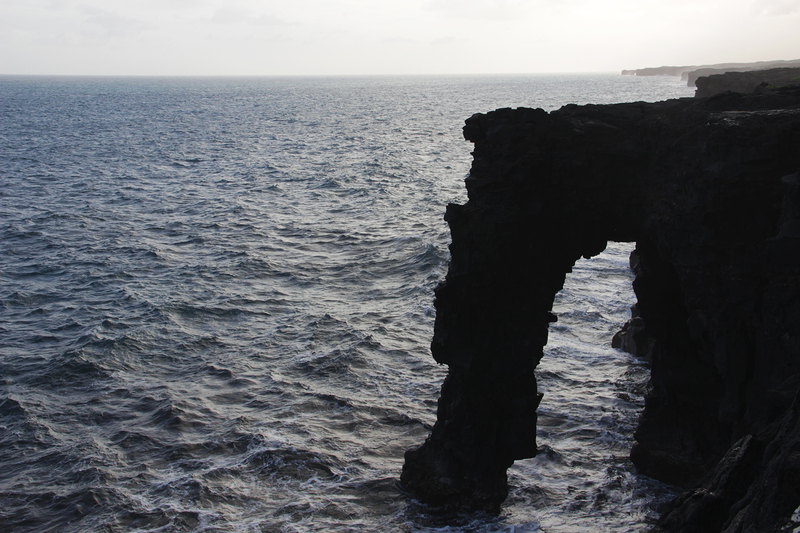 We reached the end of Chain of Craters road to find the Holei Sea Arch. 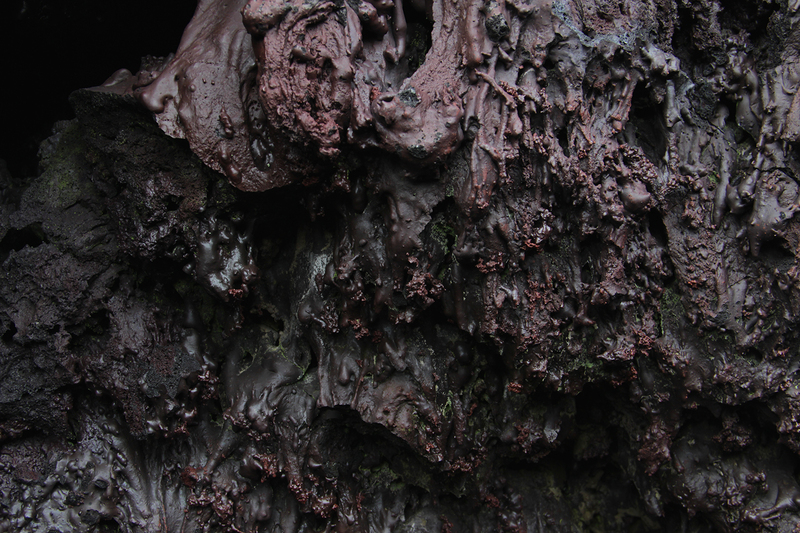 And much like its creation, it will also one day be destroyed in the same way – through erosion. That reminded me of the Twelve Apostles on the Great Ocean Road drive down in Victoria, Australia. 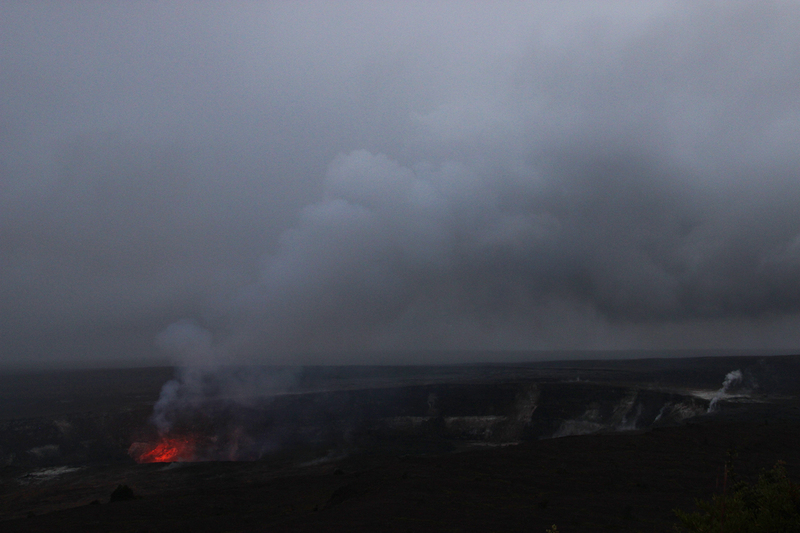 There was smoke billowing out into the sky on the other side where a lava flow was entering the ocean. The sun was quickly falling and we wanted to catch the sunset at Jaggar Museum. Unfortunately, the weather didn’t seem to want to stay on our side so it was cold, wet and foggy. 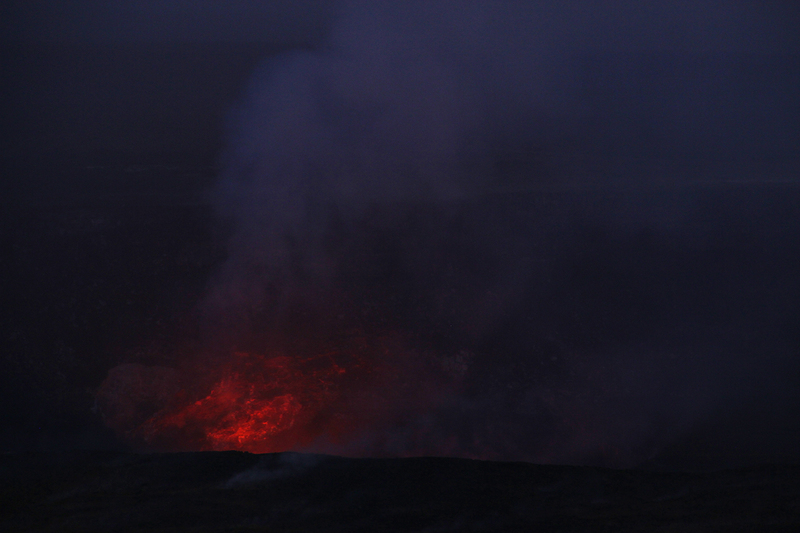 As the sun fell though, the fog did clear up a bit where we started seeing the creep of magmar/lava lake glow. 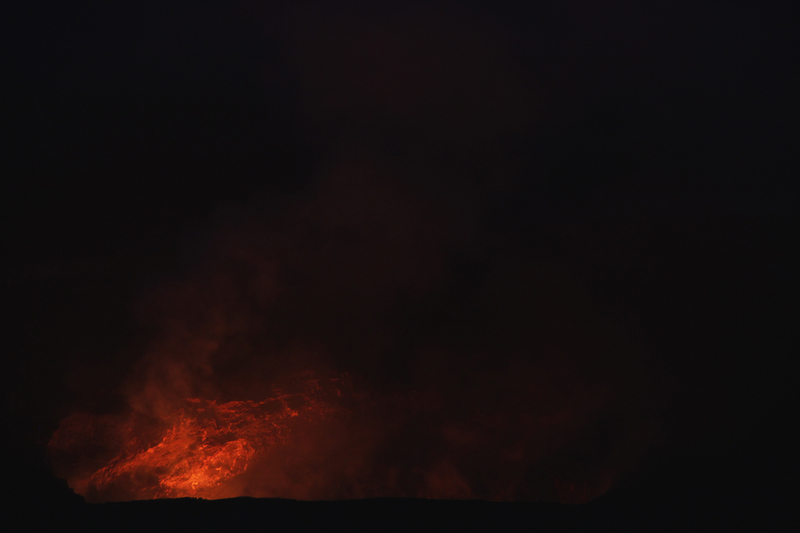 By nightfall, it was a lava disco. Then I spent some time in the neighbouring museum to learn some facts. 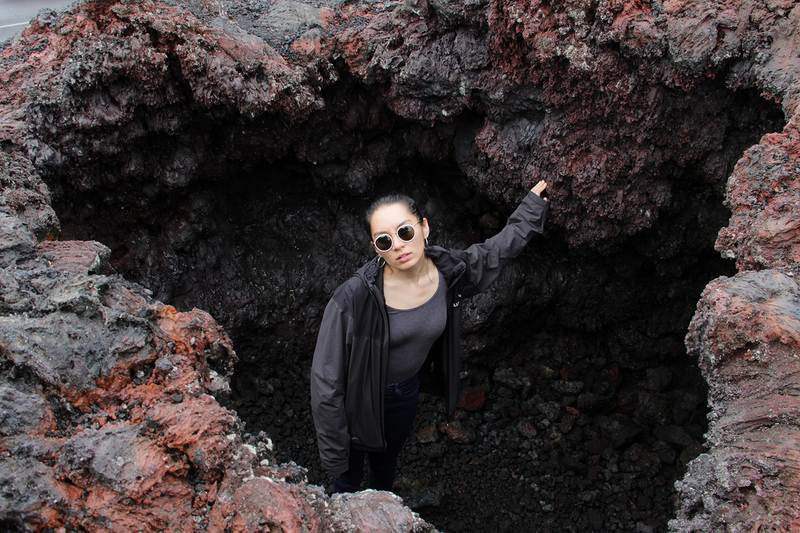 – One of the most revered spirits of the Hawaiian pantheon is the goddess of the Volcanoes, Pele. As I read brochures, read updates online or information panels, Pele was constantly message. 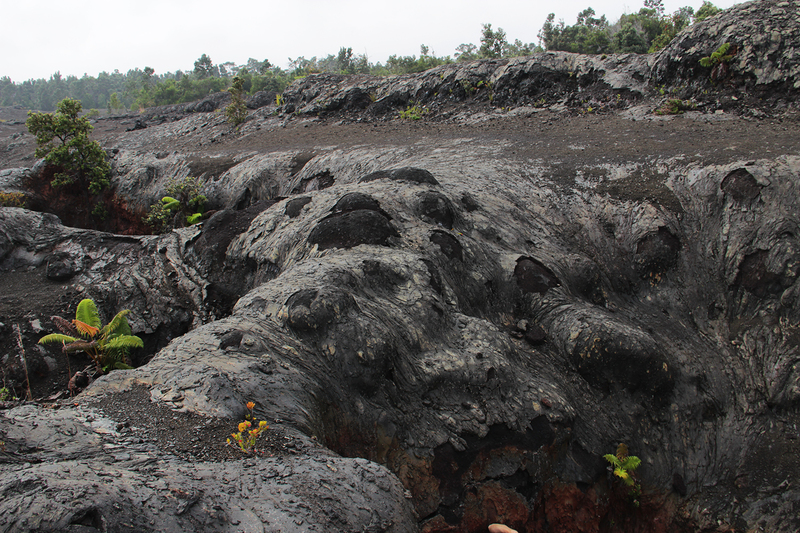 The main warning to tourists was the respect for Hawaiian culture by not poking lava flow or cooking food on it as they believed the red hot molten viscousness was the body form of Pele. – The Island of Hawaii is composed of 5 volcanoes that eventually joined together. 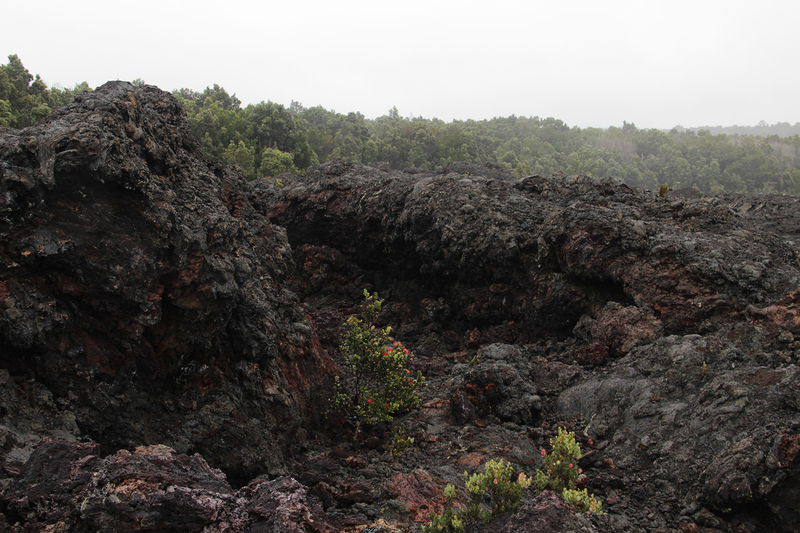 The oldest Volcano, Kohala last erupted 60,000 years ago. 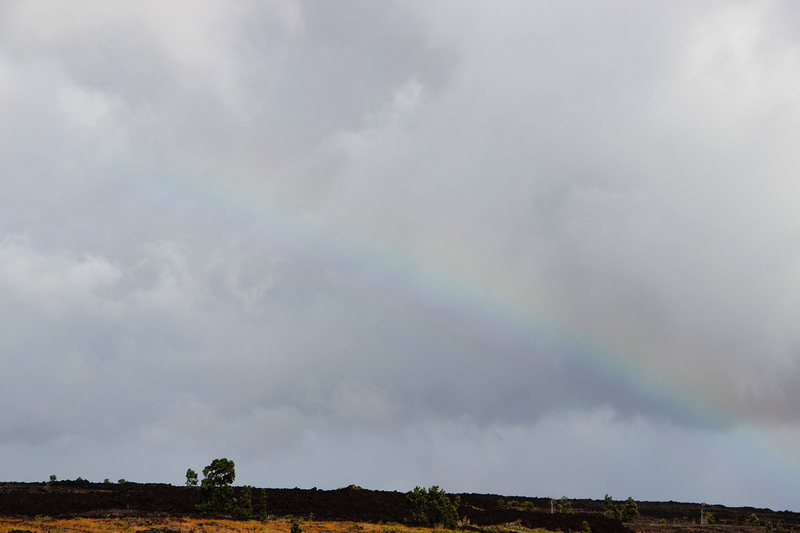 Mauna Kea, where I went up for the observatory sunset and stargazing, last erupted 4,600 years ago. 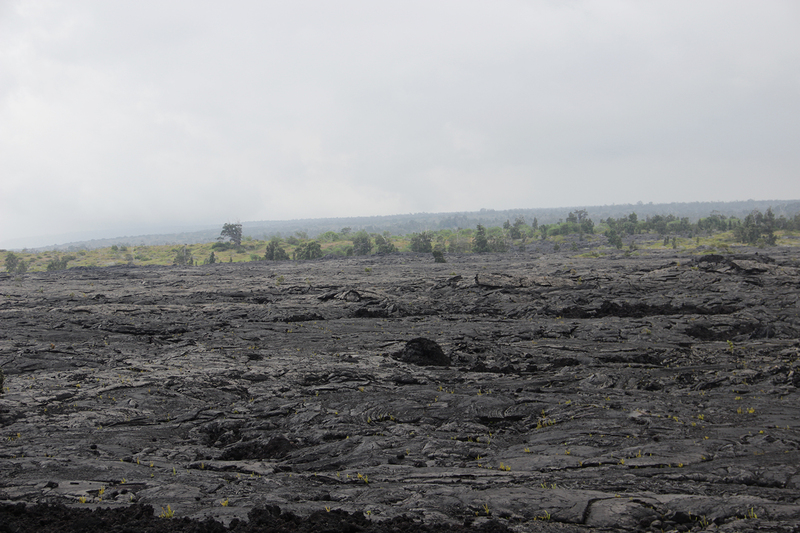 The last 3 (Kilaulea, Mauna Loa and Hualalai) have all erupted in the last 250 years. 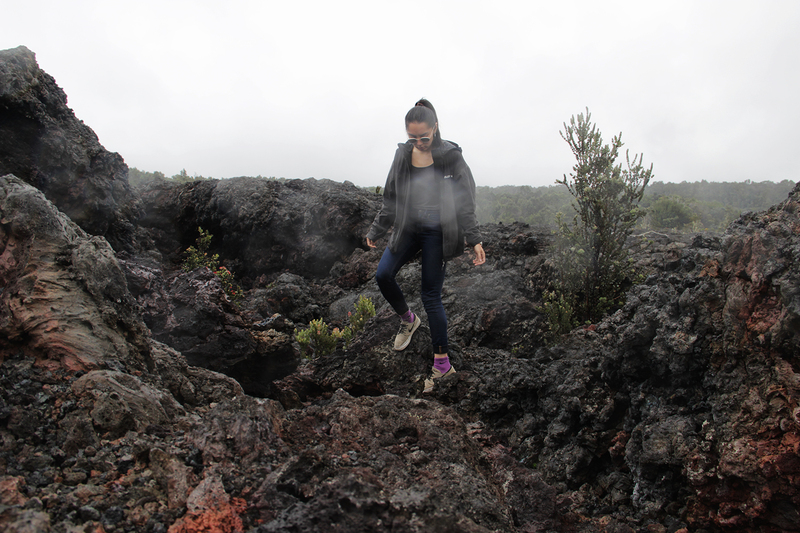 – Mauna Loa is the earth’s largest volcano. Sits taller than Mount Everest and stands approximately 17,000m above the seafloor base. 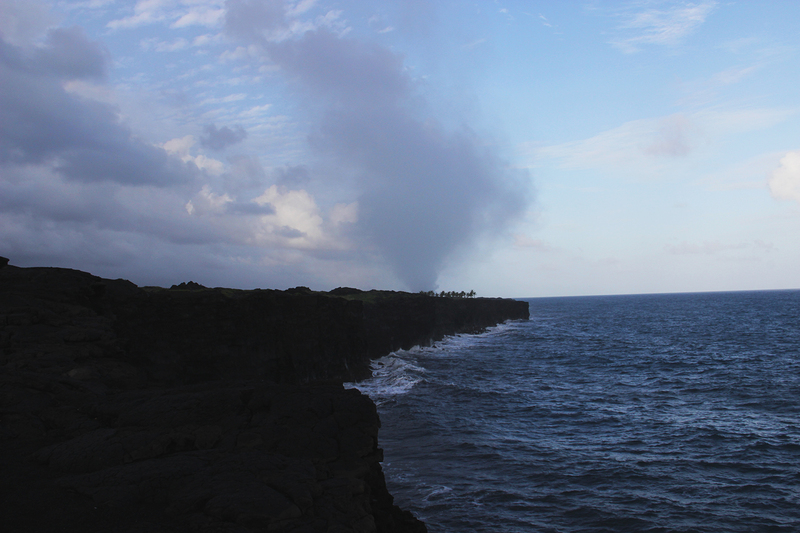 THE CRAZIEST THING EVER IS THAT THE MASS OF MAUNA LOA has compressed the seafloor by 8000m. 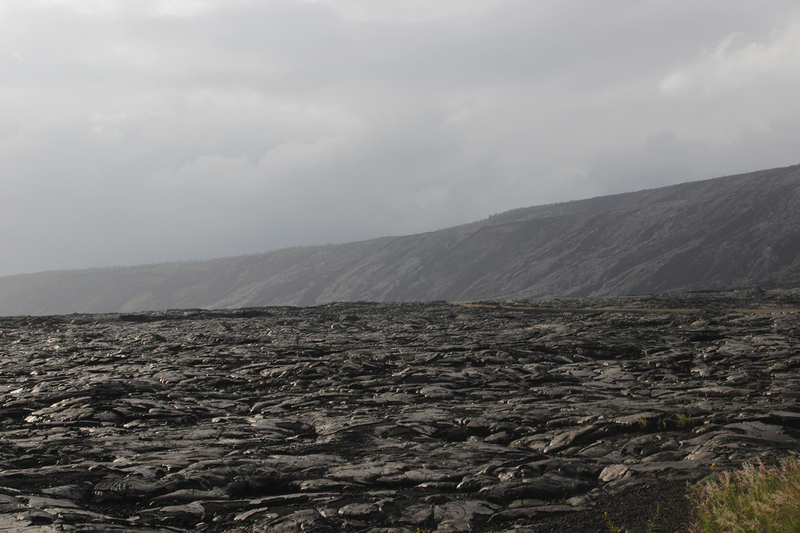 So, pre-Mauna Loa the seafloor used to sit 8000m higher. I stared at that fact for ages because I just can’t even fathom that. I mean, I know what we live on is just some outer crispy crust that takes up barely anything of the Earth’s guts but holy macaroni isn’t the world crazy! – Okay now this one is also my favourite. 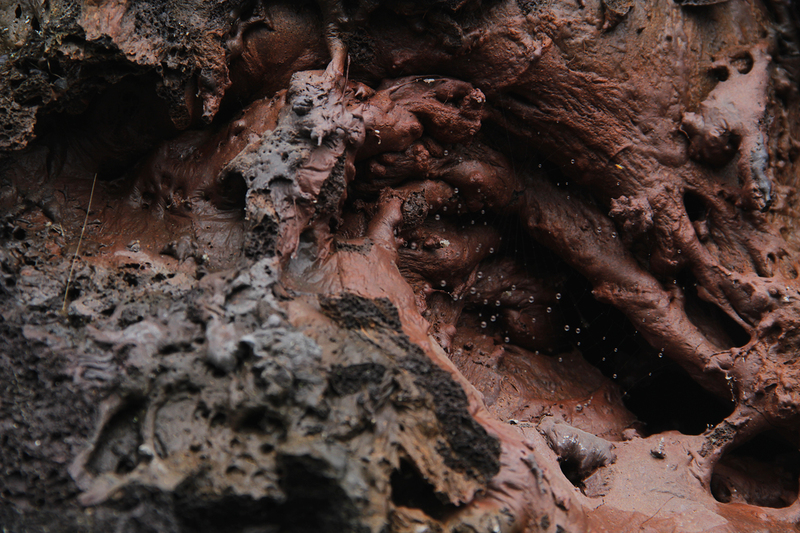 *Drum roll* THERE’S ANOTHER VOLCANO. 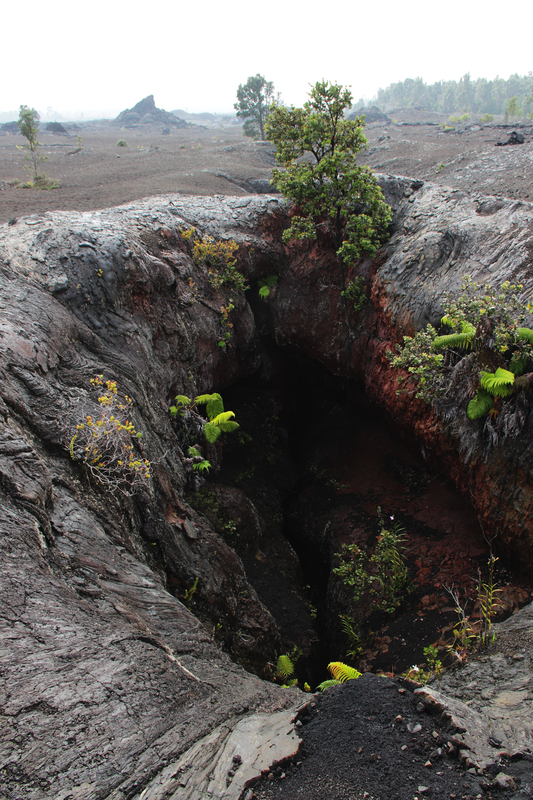 Within 40km south of Hawaii lies a submarine volcano named Loihi. 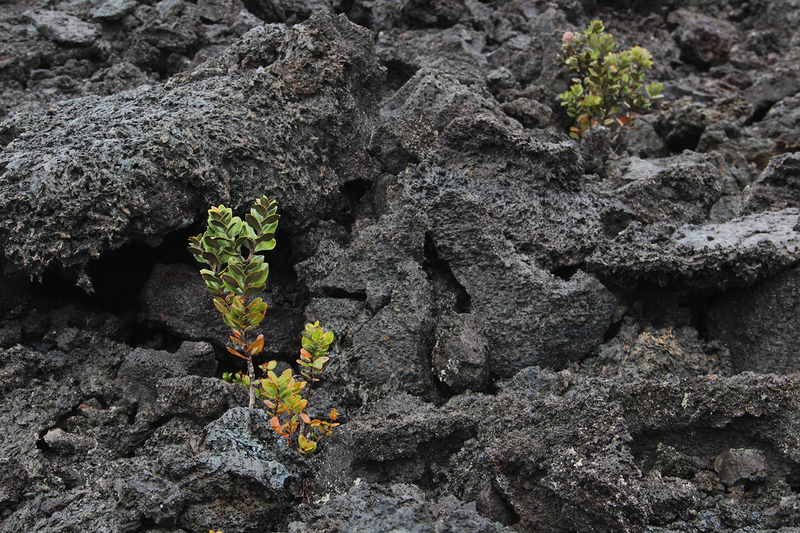 It’s summit currently lies 969 metres below sea level but geographically speaking, Loihi is growing quick. I think volcanologists believe that in 10,000 – 100,000 years, so on my 100,024th birthday, Loihi will rise up above sea level and form an island. If it continues to grow past that, then it will merge with the island of Hawaii. Okay, I could go on but I won’t. 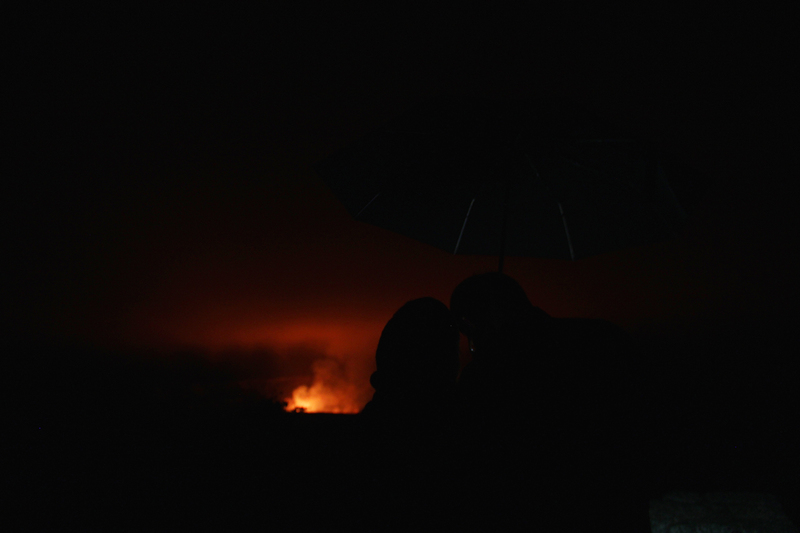 So let me end this post with this cute stalker photo I took of a couple taking shade under the rain while the land burns in front of them.